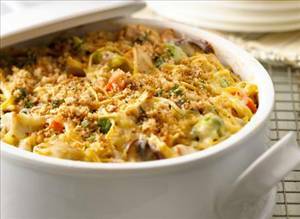 In large casserole dish, combine all ingredients. Mix well. Bake covered, 35-45 minutes. Remove cover. Bake 10-15 minutes. Serve immediately. Note: try adding different kinds of vegetables. 592 members have added this recipe to their cookbook. Weight Watcher Points 5 For free on line points calculator go to: http://onemorepound.com/ Good Luck on your Jorney! absolutely gorgeous, very filling and great on WW. According to my point calculator it would be 5 pts per serving...not bad for a meal. If you could find the half fat cream of mushroom soup it might come down a fraction...I can't get low fat cheese in my area, but I'm going to try this anyway! How many points per serving? Can this be changed to beef slices? There are 238 calories in 1 serving of Cheesy Chicken Casserole. Calorie break-down: 25% fat, 31% carbs, 43% protein.